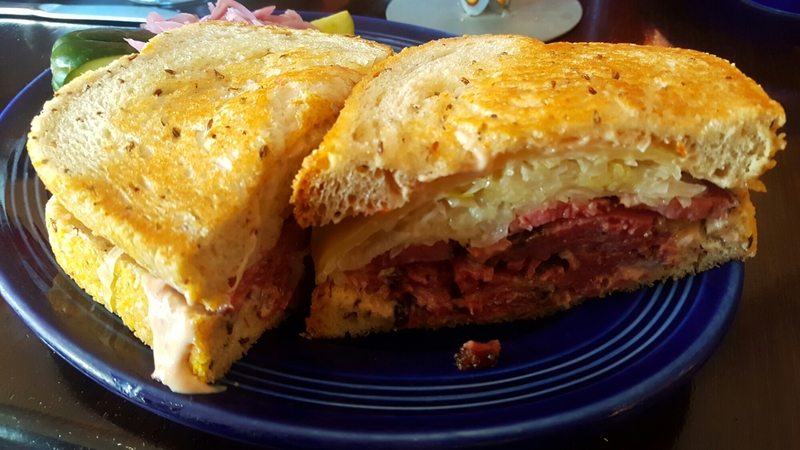 Please don’t Intrude while I’m eating a Reuben at Refuge..
Any of the Pastrami sandwiches, haven’t tried anything else yet. Next to bacon, I think beef is one of my favorite meats to eat. Succulent, tasty, a self created oil that just makes you foam at the mouth when you smell it. 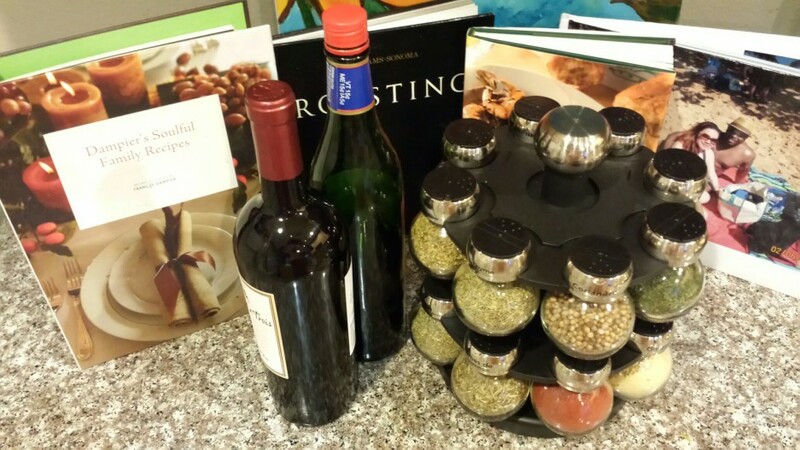 There are so many ways to cook it..
And surely you can smoke it. One of my favorite types of beef is Pastrami. It is a cut of beef that’s cured, which means it has been brined in a salt water solution; then it is rubbed with spices and smoked. Every real deal restaurant has a specific way they go about creating this tasty delight. I know a place where you definitely will not be disappointed..
And that is over at Refuge. 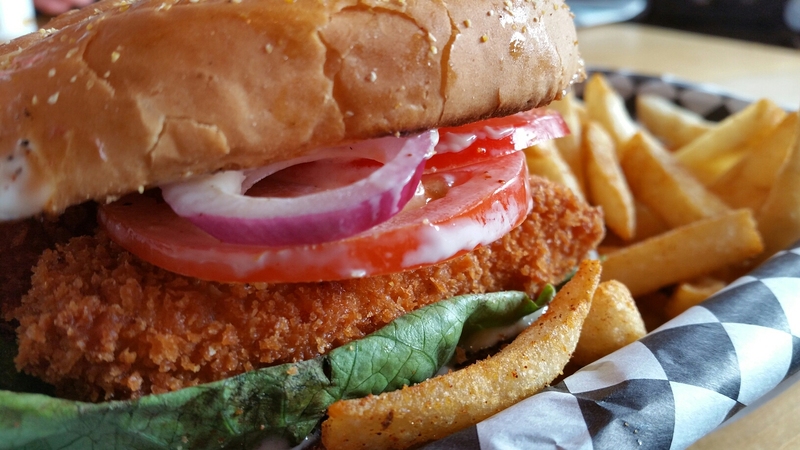 This Grub will Make your Day, at the Ice Cold Brewery of Skagway! Skagway Alaska is a very accessible town by Southeast Alaska standards. A trip to Skagway can be accomplished by Road, Sea, or Air, but most visitors to Skagway come via the sea on one of the many cruise ships that make port in this popular tourist destination. 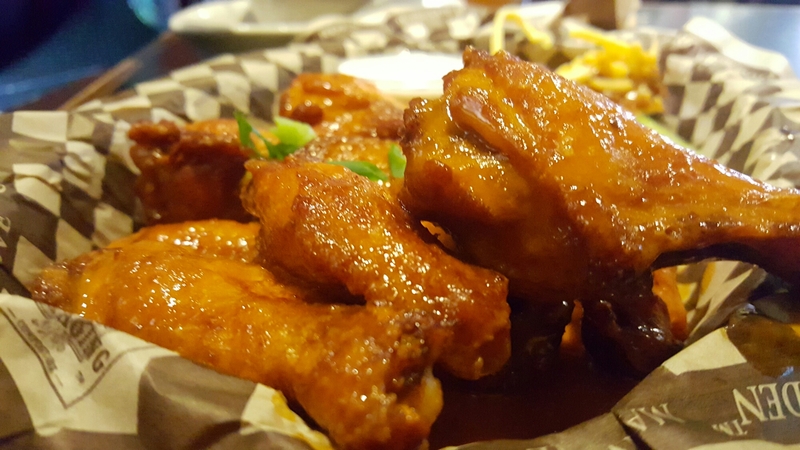 Buffalo Chicken Wings, Halibut Fish & Chips, Alaskan Beer of course!! So it’s my 40th Birthday celebration and my wife and I are on a voyage on the sea with Princess Cruises to the exotic, beautiful icy environment of Alaska. Today we stopped in Skagway for an exciting encounter with the locals and an opportunity to enjoy some hiking in the cool Mountain Tops and ice cold water rapids of Chilkoot Trail. After the long hike, we headed downtown and looked to find a relaxing, warm Alaskan Pub called Skagway Brewery. Wagyu Beef that will Melt in your Mouth at Alexander’s Steakhouse! Modern Wagyu cattle are the result of crossing of the native cattle in Japan with imported breeds. Crossing began in 1868 after the Meiji restoration in that year. The government wanted to introduce Western food habits and culture. Brown Swiss, Devon, Shorthorn, Simmental, Ayrshire, and Korean cattle were imported during this period. The infusions of these British, European and Asian breeds were closed to outside genetic infusions in 1910. The variation of conformation within the Wagyu breed is greater than the variation across British and European breeds. The three major black strains – Tajiri or Tajima, Fujiyoshi (Shimane) and Kedaka (Tottori) evolved due to regional geographic isolation in Japan. These breeding differences have produced a Japanese national herd that comprises 90% black cattle with the remainder being of the red strains Kochi and Kumamoto. In Japan there are four breeds that are considered Wagyu and those are the Japanese Black (the predominant Wagyu exported to the U.S), Japanese Brown (In the U.S. referred to as Red Wagyu), Japanese Polled and Japanese Shorthorn. There are no Japanese Polled or Shorthorns being bred outside Japan. Wagyu strains were isolated according to prefecture (state) and breeds imported for crossing were not the same in each prefecture. What a wonderful day for steak!! Steak is wonderful on a sunny day..
Steak is wonderful on a rainy day..
Heck, I’ll eat steak if aliens invaded the planet for my last meal and testament! When you are looking for mouth watering beef within an elegant setting, I know the spot! A Blessing in My Mouth over at Alaska Fish House! Ketchikan is located on the western coast of Revillagigedo Island, near the southernmost boundary of Alaska. It is 679 miles north of Seattle and 235 miles south of Juneau. The 2.2 million acre Misty Fiords National Monument lies 22 air miles east of Ketchikan. It is the first Alaska port of call for northbound cruise ships and State ferries. It lies at approximately 55° 20′ N Latitude, 131° 38′ W Longitude (Sec. 30, T075S, R091E, Copper River Meridian). The community is located in the Ketchikan Recording District. The area encompasses 3 sq. miles of land and 1 sq. miles of water. Tongass and Cape Fox Tlingits have used Ketchikan Creek as a fish camp which they called “kitschk-hin,” meaning creek of the “thundering wings of an eagle.” The abundant fish and timber resources attracted non-Natives to Ketchikan. In 1885, Mike Martin bought 160 acres from Chief Kyan, which later became the township. The first cannery opened in 1886 near the mouth of Ketchikan Creek and four more were built by 1912. The Ketchikan Post Office was established in 1892. In the late 1890s, nearby gold and copper discoveries briefly brought activity to Ketchikan as a mining supply center. Alaska is one of God’s most peaceful and natural beauty’s still alive and well in America. Huge white icy glaciers, healthy green forests, and wildlife that inhabits both land and sea, like bald eagles, whales, orcas and more. Not only do they have great scenery but great food as well! And that’s at Alaska Fish House in Ketchikan,Alaska. Definitely getting my fill..at Princess Cruises’ Crown Grill! Princess Cruises began in 1965, when founder Stanley McDonald chartered Canadian Pacific Limited‘s Alaska cruise ship Princess Patricia for Mexican Riviera cruises from Los Angeles during a time when she would have usually been laid up for the winter. However, Princess Pat, as she was fondly called, had never been designed for tropical cruising, lacking air-conditioning, and Princess ended her charter in favor of a more purpose-built cruise ship Italia. Princess, who marketed the ship as Princess Italia, but never officially renamed her, used the ship to inaugurate their Mexican Riviera cruises out of Los Angeles and did not receive the Princess logo on her funnel until 1967. In 1969, the Princess Italia was used on Alaskan cruises from San Francisco, but by 1973, the charter was canceled, and the Italia returned to Europe on charter to Costa Cruise Line. 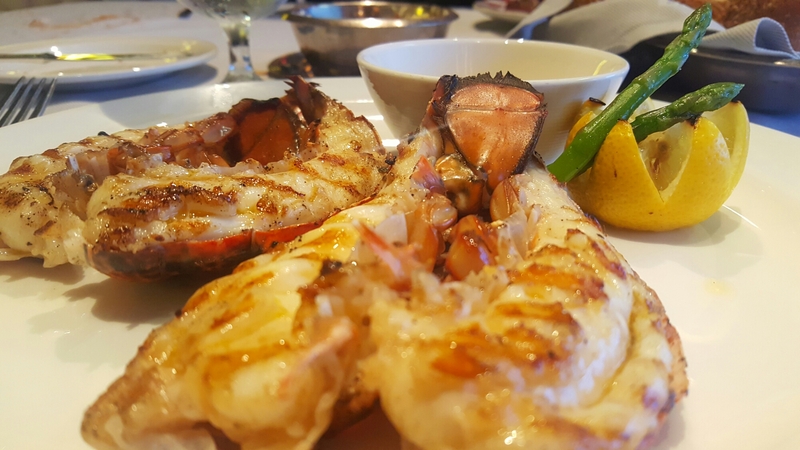 Lobster Tail, Tiger Prawns, Rib Eye..Whatever your heart desires!! Being on the beautiful seas of the Pacific while listening to awesome musical artists and adventurous movies on a huge screen outside in the moonlight on top of a huge Princess Cruise ship is a delightful experience in itself. Unlimited all you can eat pizza, burgers and fries totally can make your day. 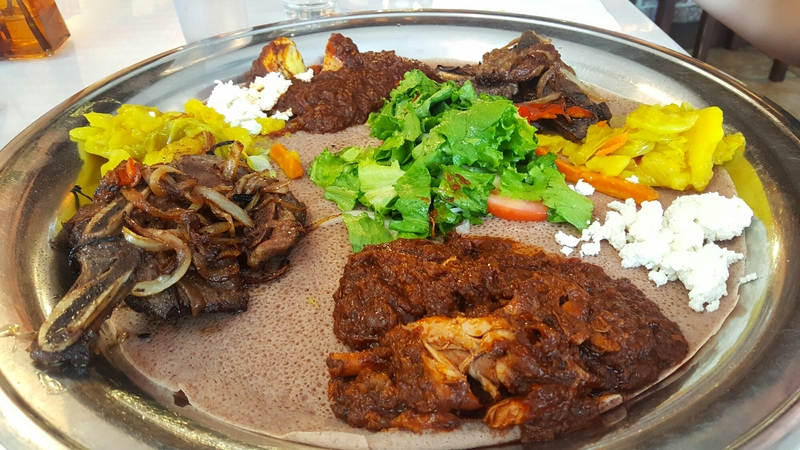 Ethiopian food good and plenty; over at Zeni! Ethiopia was under Italian military control for a period (1935–46) when Benito Mussolini (1883–1945) was in power. Except for that time, Ethiopian culture has been influenced very little by other countries. Ethiopia’s mountainous terrain prevented its neighbors from exercising much influence over the country and its customs. Exotic spices were introduced to Ethiopian cooking by traders traveling the trade routes between Europe and the Far East. Ethiopia went through a period of recurring drought and civil war during 1974–91. In 1991 a new government took over, and civil tensions were relieved somewhat because the coastal territory seceded from the inland government, creating the new nation of Eritrea. Just thinking about that word brings a tingle to my ear. There is an exotic food that may be hard to find in some areas, but I assure you that it is definitely worth the exploration. Hawaiian goodness with every dish to admire; at Rumfire! There is something about the nature of truffles that have captivated people for over a thousand years. Perhaps it is the dazzling, irresistible aroma that continues to draw generation after generation to this delicacy. The history of these black pearls of the Earth is often filled with mystery, superstition and, at one time, damnation. Have you ever tasted something so good that you wanted to cry? 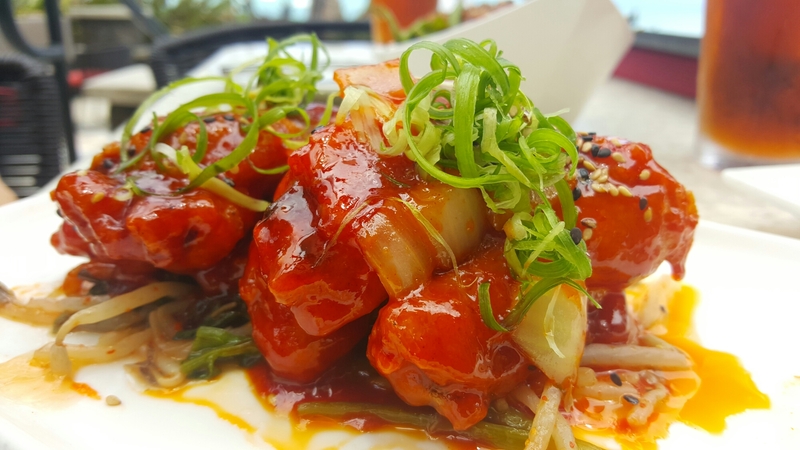 I assure you that, the ambiance, the view of the beautiful Pacific Ocean, and the exotic delicious flavors of the food at this new found paradise was all the way superb. Just writing this letter makes my heart beat fast. Time to dive into one of my favorite places on Earth; Rumfire on the glorious beach of Hawaiian waters! 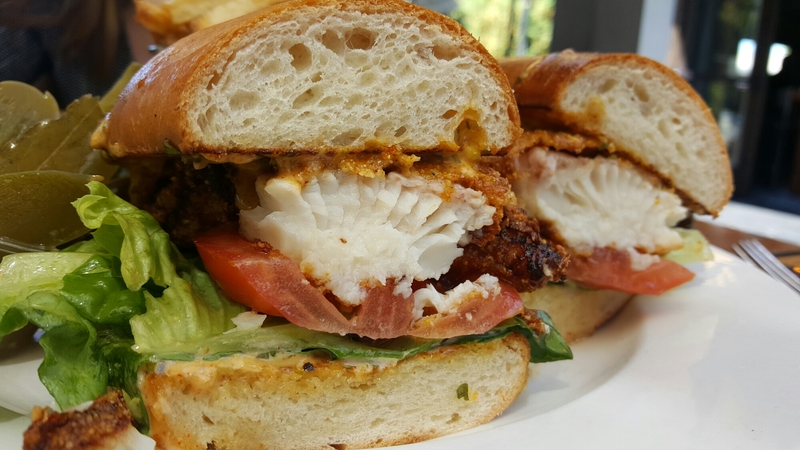 This Catfish Po’Boy will make you lose your mind; Happy 4th of July from Steins! Poor boy sandwiches represent bedrock New Orleans. The shotgun house of New Orleans cuisine, Po-boys are familiar but satisfying. The sandwich is as diverse as the city it symbolizes. The crisp loaves have served as a culinary crossroads, encasing the most pedestrian and exotic of foods: shrimp, oyster, catfish, soft-shell crabs as well as French fries and ham and cheese. Comfort food in other cities seldom reaches such heights. As with many culinary innovations, the poor boy has attracted many legends regarding its origins. However, documentary evidence confirms that your grandparents’ stories about one particular restaurant were right. Happy hour is one of my favorite dining sensations. 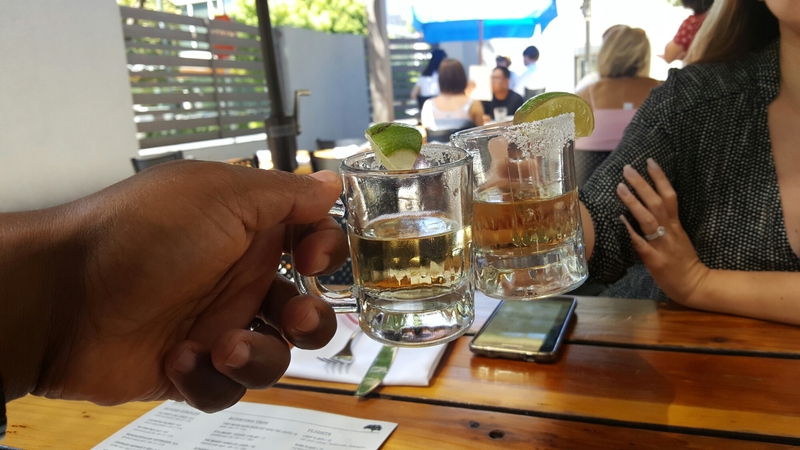 It is a specific time of the day where bars, restaurants or any other type of food serving facility that serves alcohol, offers delicious reduced price delights with your favorite drink to do cheers with a lover or friend. It is the 4th of July, 2016 and my wife and I are ready to kick it off with a bang! That bang is with 2 shots of Don Julio over at Steins! 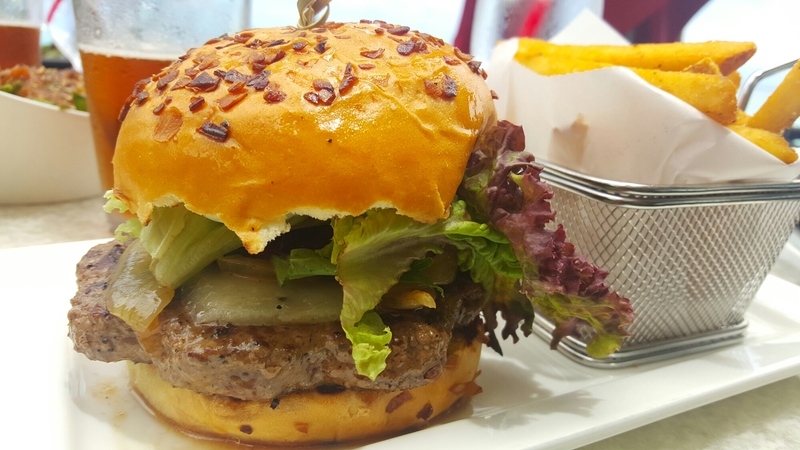 You’ll Cry out for your Mom after Eating a Burger at Nom! Om Nom Nom Nom is an onomatopoeic phrase used to indicate that someone is eating or that a food item is particularly delicious. The expression is often used to caption image macros that involve food or appear as if something is being eaten. This is when you usually have hit the peak of your day and you need that energy boost. Whether it is a break from work or after a morning work out, it will definitely give you a shot to make it through the rest of your day. I’ve had a long morning at work and I need a big dose of carbs to get my mood back stable and joyous. What better way to get a dose of joy back in your life than a juicy Burger. I found the spot for that; and it’s called Nom Burger. So like I said, I’m famished and ready to sink my teeth into some greasy sweat dripping flesh. 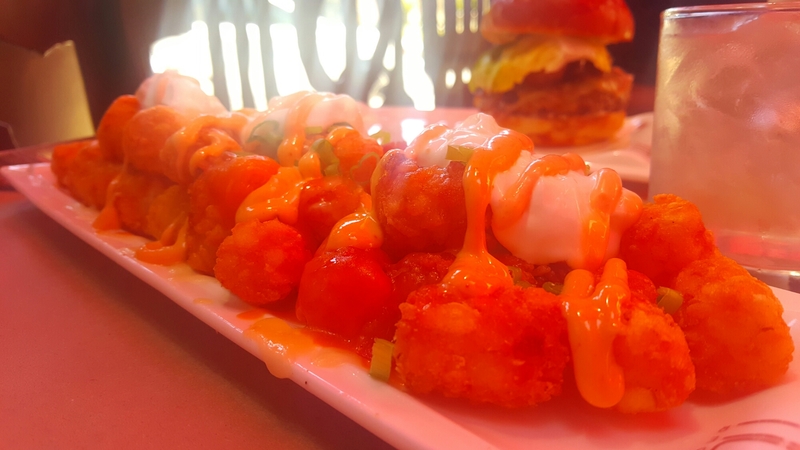 I arrive at Nom Burger and skim through the menu, to not only see a list of some well thought out toppings and structure for different types of burgers, but also loaded tater tots. In America, we have been raised with tater tots as kids. I remember through grade school you would see tater tots almost with every meal. Corn dog and Tater Tots..
We even would have Tater Tots with fruit. I ordered the loaded Tater Tots and the Nom Burger described as an All-natural beef patty, gruyere, caramelized red onions, butter lettuce and roasted tomato aioli. I also made sure to add candied bacon!! Fast forwarding; my food arrives and poses for me like Miss Universe and Miss California. Miss California consisted of beautiful glistening tater tots laying one on top of another with a light blanket of sour cream and an orange top begging me to lay down with her. 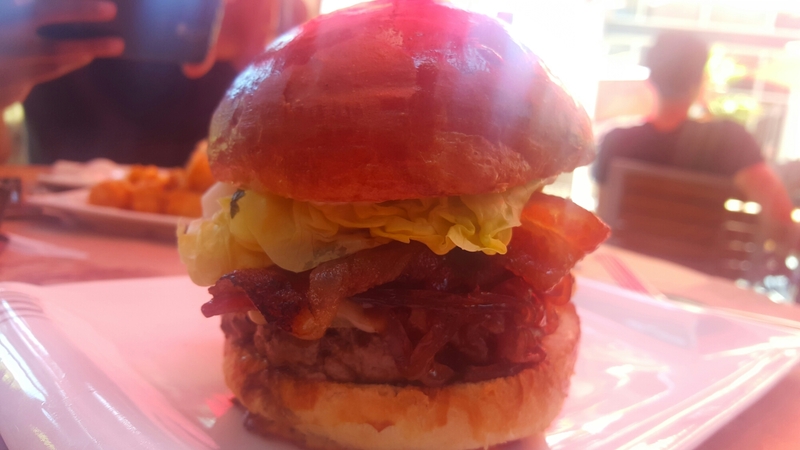 Miss Universe was a succulent looking Burger, thick in the body but able to fit in all of the wrapped lettuce and onion fittings that surrounded her with buns so soft you want to sleep on them. I dive into to a tater tot first and she explodes with flavor in my mouth. The perfect crunch and soft textures within, as well as the saltiness, spice and coolness from the drizzled sauce opens up my palate like a grenade hit it. I’m really excited now so I dive in the burger next with my heart pounding out of my chest. The bun is sweet, soft and tasty all on its own. 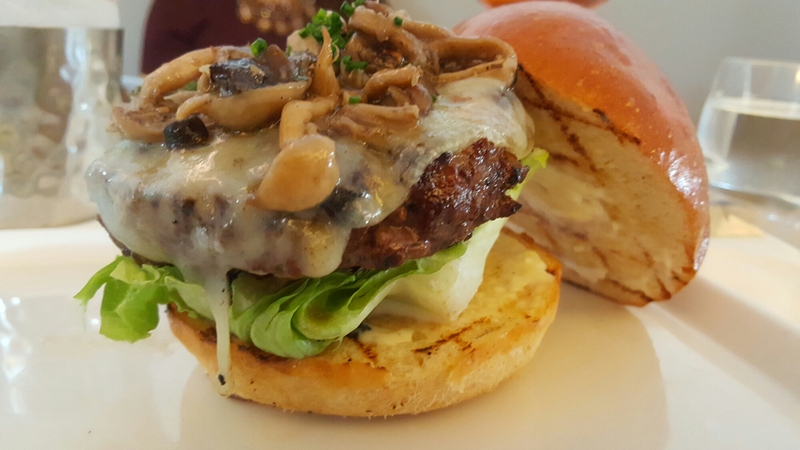 The burger is super juicy, flavored and succulent. The candied bacon had patent deserving flavorful! Powerfully flavorful and sweet; combined with the grilled onions, it was a complete masterpiece. Let me get more tater tots in my mouth. Bang!! Instant gratification! True live action eating! Great job Nom Burger! Ooooooo Wee.. Loving these shrimp at Fumi’s! The 1800’s were a time of great change for Hawaii. Christian missionaries became influential after King Kamehameha II (Liholiho) ended the traditional kapu (taboo) system. Many of the historic churches on Oahu are reminders of Christianity’s influence, such as Kawaiahao Church in downtown Honolulu, which was a place of worship for Hawaiian kings and alii (royalty). Soon, new commerce emerging from whaling, sugar and pineapple industries resulted in an influx of western settlers. As agriculture boomed in the late 19th century, plantation owners found themselves in the midst of a labor shortage. Immigrants from Japan, China, Korea, Puerto Rico, Portugal, Russia and the Philippines arrived to work in the plantations. Today, this mix of ethnicities is the source of Hawaii’s multicultural population. Visitors can step backward in time to explore this era at Waipahu’s Plantation Village. You can also still see the smoke stack of the old Waialua Sugar Mill as you drive toward historic Haleiwa town. On the morning of December 7, 1941, the Imperial Japanese Navy attacked Pearl Harborpushing America into World War II. The surprise attack was aimed at the Pacific Fleet of the United States Navy and its defending Army Air Corps and Marine Air Forces. The attack damaged or destroyed 12 American warships, destroyed 188 aircraft and resulted in the deaths of 2,403 American servicemen and 68 civilians. Hawaii is one of the most beautiful exotic places on Earth. We love this land for it’s untainted Godly design and it’s clear waters. And these clear waters contain some excellent seafood delights to fulfill your mouth watering desires. 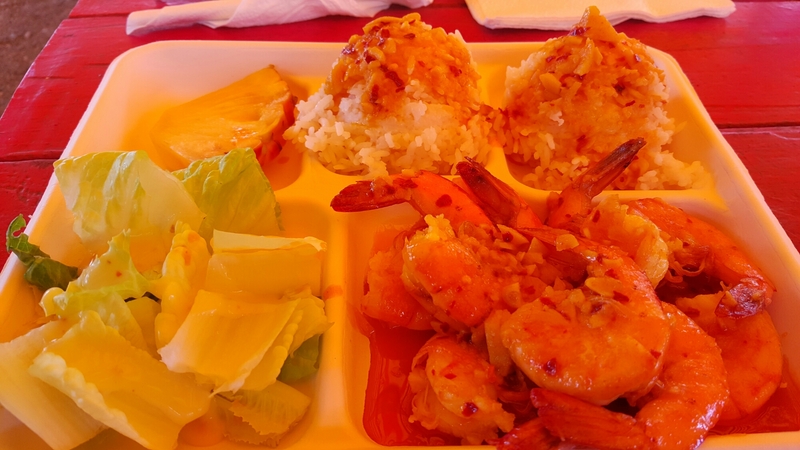 Today we will talk about a great place to enjoy some of these delicious seafood critters in Oahu and that is Fumi’s food truck.